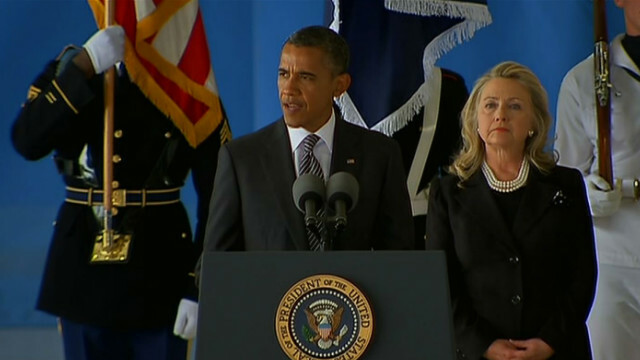 President Barack Obama speaks Friday at a ceremony in for the four Americans killed Tuesday in Benghazi. Editor's note: Several protests stemming at least in part from an anti-Islam film produced in the United States are unfolding outside U.S. embassies around the world. Friday's protests follow ones Tuesday at the U.S. Embassy in Cairo and the U.S. Consulate in Benghazi, where attacks killed the U.S. ambassador to Libya and three other Americans. In Tunisia, protesters have scaled a U.S. Embassy gate and set fire to cars on the property, a journalist there says. In Egypt, the influential Muslim Brotherhood canceled nationwide protests planned for Friday, but a running battle between police and protesters in Cairo continued into its fourth day. Follow the live blog below for all of the developments around the world. [Updated at 3:04 p.m. ET] A ceremony at Maryland's Joint Base Andrews for the returned bodies of the four Americans killed at the Benghazi consulate has ended, and the caskets are being carried to hearses. See the 2:59 and 2:51 p.m. entries for remarks by President Barack Obama, who said the four laid down their lives "in service to us all." "The United States of America will never retreat from the world. We will never stop working for the dignity and freedom that every (person) deserves. ... That’s the essence of American leadership. ... That was their work in Benghazi, and that is the work we will carry on." At the beginning and toward the end of his remarks, Obama cited the Bible's John 15:13: "Greater love hath no man than this, that a man lay down his life for his friends." Obama said the four killed Americans laid down their lives "in service to us all." "Their sacrifice will never be forgotten," Obama said. [Updated at 2:51 p.m. ET] President Barack Obama, at a ceremony for the returned bodies of the four Americans killed at the Benghazi consulate, is now eulogizing the four at Joint Base Andrews in Maryland. Ambassador Chris Stevens, Obama said, "was everything America could want in an ambassador." "Four Americans, four patriots. They loved this country. They chose to serve it, and served it well," Obama said. "They had a mission they believed in. They knew the danger, and they accepted it. They didn't simply embrace the American ideal, they lived it; they embodied it. The courage, the hope, and yes, the idealism - that fundamental American belief that we could leave this world a little better than before." "Today we bring home four Americans who gave their lives for our country and our values. To the families of our fallen colleagues, I offer our most heartfelt condolences and deepest gratitude." She saluted Sean Smith, a computer expert, as someone known as "an expert on technology by colleagues in Pretoria, Baghdad, Montreal and The Hague." She hailed ex-Navy SEAL Tyrone Woods as someone who protected diplomatic personnel since 2010 "in dangerous posts" around the world. "He had the hands of a healer as well as the arms of a warrior, earning distinction as a registered nurse and certified paramedic," Clinton said of Woods. Clinton also hailed the other ex-Navy SEAL, Glen Doherty. "He, too, died as he lived, serving his country and protecting his colleagues." Clinton said Stevens, as a diplomat, "won friends for the United States in far-flung places.” She thanked his parents, who were at the ceremony, for the "gift" that Stevens was. The ceremony was at a hangar at Joint Base Andrews in Maryland. [Updated at 2:35 p.m. ET] The ceremony for the returned bodies of the four Americans killed at the Benghazi consulate has begun. A prayer is being offered. Secretary of State Hillary Clinton will speak soon, followed by Obama. [Updated at 2:31 p.m. ET] Marines at Joint Base Andrews in Maryland are removing from a plane the flag-draped caskets of four Americans killed in the consulate attack in Libya, including U.S. Ambassador J. Christopher Stevens. The caskets will be placed at a hangar nearby, and President Barack Obama and Secretary of State Hillary Clinton will give remarks. [Updated at 2:28 p.m. ET] We're awaiting a ceremony at which U.S. President Barack Obama will honor the arrival of the bodies of of U.S. Ambassador J. Christopher Stevens and three other Americans killed in the attack on the U.S. Consulate in Benghazi, Libya. Obama, Vice President Joe Biden, Secretary of State Hillary Clinton and Defense Secretary Leon Penetta have entered the hangar where the ceremony will take place at Joint Base Andrews in Maryland. [Updated at 2:22 p.m. ET] Marines will take the caskets off a plane at Joint Base Andrews in Maryland. Obama and Secretary of State Hillary Clinton will give remarks. Defense Secretary Leon Panetta will also be present, Pentagon spokesman George Little said. People are seated at a facility on the base. The caskets will flank the podium from which Obama and Clinton will speak. [Updated at 1:41 p.m. ET] Three people were killed and 28 wounded during protests outside the U.S. Embassy in Tunis on Friday, Tunisia state television reported. [Updated at 1:23 p.m. ET] U.S. President Barack Obama and Vice President Joe Biden will join Secretary of State Hillary Clinton at this afternoon's "transfer of remains ceremony" marking the return of the remains of the four Americans killed this week in Benghazi, Libya. Obama and Clinton will deliver brief remarks at the 2:15 p.m. ET ceremony at Joint Base Andrews in Maryland. [Updated at 12:23 p.m. ET] Nigerian military and police fired shots to disperse a crowd of protesters in the city of Jos, an eyewitness said. About 2,000 people protesting the anti-Islamic film gathered at a central mosque, and security forces intervened when the crowd started moving toward the city center. [Updated at 12:15 p.m. ET] Some protesters who scaled the gates of the U.S. Embassy in Tunis, Tunisia, reached a garden outside the building but have not breached the building itself, journalist Zeid Mhirsi reports. Also, the thick, black smoke that we previously reported was near the Embassy is coming from burning vehicles on the Embassy grounds, Mhirsi reported. Earlier, he reported that protesters took down a U.S. flag from a pole at the Embassy and replaced it with a black flag. Police were firing tear gas in an attempt to disperse them. (See 10:20 and 10:42 a.m. entries.) Hard-line Muslims known as Salafists were among the demonstrators, Mhirsi reported. - In Afghanistan, hundreds of demonstrators in the eastern Nangarhar province burned a U.S. flag and chanted "Death to America" and "We condemn the film." The demonstration lasted about an hour and ended peacefully, a local official said. The Afghan government has ordered an indefinite block of YouTube to prevent people there from watching the clips and staging violent protests. - In Baghdad, Iraq, hundreds of followers of the radical Shiite Muslim cleric Muqtada al-Sadr chanted "No to America, no to Israel." - In Jerusalem, Palestinians marched from the al-Aqsa mosque toward the U.S. Consulate, but were prevented from reaching the mission by Israeli riot forces. - In Syria, hundreds gathered outside the U.S. Embassy in Damascus. Protesters waved placards that condemned the film and blamed the U.S. administration for allowing the production and broadcast of it, according to the state-run Syrian Arab News Agency. - In Iran, the Islamic Propagation Coordination Council called for nationwide rallies Friday to protest the film and what it is calling a U.S.-backed plot against Muslims, according to the state-run IRNA news agency. [Updated at 11:57 a.m. ET] An update on Friday's protest outside the U.S. Embassy in Khartoum, Sudan: Journalist Isma'il Kushkush says no protesters have been able to get inside the compound, and that police and security forces appear to have the situation under control. Small fires are burning nearby. Kushkush said he believes protesters set tires ablaze. For more on the Khartoum protests, including one at the German Embassy there, see the 9:54 and 8:42 a.m. entries. [Updated at 11:52 a.m. ET] Ninety-three protesters have been arrested in Egypt since Thursday night, Egyptian Interior Ministry spokesman Alaa Mahmoud said. Forty-eight officers have been injured, he added. [Updated at 11:40 a.m. ET] Protesters in southern India have been arrested on suspicion of throwing rocks at the U.S. Consulate in Chennai, the city police commissioner said. As many as 200 protesters were demonstrating in front of the building, but the number arrested was not reported. There were no reported injuries. [Updated at 10:57 a.m. ET] Video from Tunisia's capital shows thick, black smoke rising from an area near the U.S. Embassy. It's not clear what was on fire. Protesters there had taken down a U.S. flag from the embassy property and replaced it with a black flag, journalist Zeid Mhirsi reported. Police fired tear gas at protesters as some of them climbed the property's walls. [Updated at 10:42 a.m. ET] Protesters have taken down a U.S. flag from a pole at the U.S. Embassy in Tunis, Tunisia, and replaced it with a black flag, journalist Zeid Mhirsi reports. Earlier, Mhirsi reported protesters were climbing the building's gates, and police fired tear gas in an attempt to disperse them. (See 10:20 a.m. entry.) Hard-line Muslims known as Salafists were among the demonstrators, Mhirsi reported. [Updated at 10:25 a.m. ET] A U.S. Marine Corps security team is being sent to help protect U.S. diplomatic installations in Yemen, including the Embassy in Saana, a senior U.S. official said, according to CNN's Barbara Starr. Earlier today, Yemeni police opened fire to stop protesters from reaching the U.S. Embassy in Saana, witnesses said (see 7:31 a.m. entry). The protection team is similar to the team of 50 Marines that was sent earlier this this week to Tripoli, Libya, in the wake of the attack in Benghazi. [Updated at 10:20 a.m. ET] Protesters are climbing the gates of the U.S. Embassy in Tunis, Tunisia, and police have fired tear gas in an attempt to disperse them, journalist Zeid Mhirsi reports. that some protesters are waving black flags as they attempt to vandalize the gates. [Updated at 10:15 a.m. ET] U.S. Secretary of State Hillary Clinton is scheduled to receive the remains of the U.S. diplomats killed in Libya at Andrews Air Force Base at 2 p.m. ET Friday. [Updated at 10:13 a.m. ET] Add Tunisia to the list of Friday's protests. Hundreds of protesters have left Friday prayers and are heading to the U.S. Embassy in a neighborhood in Tunis, journalist Zeid Mhirsi reported. There is a strong Tunisian police presence in the area. Hard-line Muslims known as Salafists were among the demonstrators, who were in pickup trucks and on foot. [Updated at 9:54 a.m. ET] Ron Hawkins, a spokesman for the U.S. Embassy in Khartoum, said that because Friday is a non-work day, most of the staff and Embassy personnel are not there as protesters gather outside the building. As far as security goes, Marines are assigned there, and local police officers were sent there earlier Friday as a precautionary measure, Hawkins said. Earlier Friday, a fire was set at the vacated German Embassy as protesters gathered there. The protest at the U.S. building so has been peaceful, journalist Isma'il Kamal Kushkush said (see 8:42 a.m. entry). [Updated at 9:31 a.m. ET] More information from Khartoum, Sudan: Protesters have gathered outside the U.S. Embassy there, a journalist at the scene said. The demonstration is peaceful so far. Earlier today, protesters in Khartoum set the German Embassy on fire and also rallied outside the nearby UK Embassy (see 8:42 a.m. entry). The German Embassy was vacated before the protests. [Updated at 9:24 a.m. ET] Lebanon has joined the list of Friday protests. One person was killed by police in Tripoli, Lebanon, after a group of armed men stormed a KFC restaurant amid protests in the city, Lebanese security forces told CNN. About 40 armed men were spotted among 3,000 protesters, officials said. Gen. Bassam Ayoubi, of the Lebanese internal security forces, said a group of armed men stormed the KFC and asked people to leave. Ayoubi said that the armed men then set the KFC on fire, at which time police arrived and began to fire at the armed men, killing at least one of them. Twenty-five were injured, he said, but it wasn't clear which of the injured were on which side. [Updated at 9:09 a.m. ET] The German Embassy in Khartoum, Sudan, was vacated before the protest that reportedly has set the building on fire, the German Foreign Ministry said. Foreign Ministry in Berlin to discuss the situation in Khartoum. Journalist Isma'il Kamal Kushkush told CNN about 30 minutes ago that the German Embassy in Khartoum was on fire after protests against the online anti-Islam video. Fifteen protesters have been injured in Egypt on Friday, according to Dr. Mohamed Sultan, a health ministry spokesman. Most of the injuries were related to inhaling tear gas or getting it into their eyes. Two hundred twenty-four people have been injured this week in protests in Cairo, 11 of whom have been hospitalized, Sultan said. On Friday, officers armed with shields and batons, backed by an armored personnel carrier, rushed a group of several hundred protesters shortly after dawn to quell a violent demonstration that had raged through the night in Cairo. After the rush, a smaller number of demonstrators regrouped near the U.S. Embassy across from police lines, and stones and tear-gas canisters once again crossed in the air. Police fired rubber bullets at protesters. The army began constructing a wall of concrete blocks about 10 feet high across the road leading to the embassy. Hours later, in the afternoon, youths climbed the newly built wall and threw rocks at police, according to eyewitnesses. Security forces fired tear gas and used water cannons to hold off the rioters. But 100 to 200 hundred meters away in Tahrir Square, a few thousand protesters congregated peacefully. [Updated at 8:42 a.m. ET] The German Embassy in Khartoum, Sudan was on fire Friday after protests against the online anti-Islam video, a journalist on the scene, Isma'il Kamal Kushkush, said. No embassy personnel were believed to be inside. The UK Foreign Office also says protesters were demonstrating Friday outside its embassy, next to the German Embassy, in Khartoum. [Updated at 8:35 a.m. ET] U.S. embassies aren't the only Western diplomatic posts facing protests on Friday. Protests have been reported outside the UK and German embassies in Khartoum, Sudan. UK Foreign Office Spokesperson Mandy Heffield confirmed there is an ongoing demonstration outside the British Embassy in Khartoum. Sudanese police are on the scene, Heffield said. Earlier, a journalist on the scene said thousands of protesters had marched on the German Embassy in Khartoum, and that a few protesters jumped onto the embassy grounds and pulled down the German flag. Riot police fired tear gas, causing the protesters to pull back, the journalist said. [Updated at 8:30 a.m. ET] Thousands of protesters marched on the German Embassy in Khartoum, Sudan, on Friday, as protests against a short online film mocking the Prophet Mohammed swept across the Muslim world, a journalist on the scene said. A few demonstrators were able to jump into the embassy grounds and pull down the German flag, Isma'il Kamal Kushkush said. Riot police fired tear gas, causing the protesters to pull back. The German Embassy is next to the British Embassy, which did not seem to be the focus of the demonstration. [Updated at 7:40 a.m. ET] Afghanistan saw its first anti-American protest over the film Friday, as hundreds of demonstrators burned a U.S. flag and chanted "Death to America" and "We condemn the film." The demonstration in Nangarhar province lasted about an hour and ended peacefully, said Zia Abdulzai, a spokesman for the governor of the eastern province. [Posted 7:31 a.m. ET] Yemeni police opened fire Friday to stop protesters from reaching the U.S. Embassy in Sanaa, witnesses told CNN. Meanwhile, Egypt's Muslim Brotherhood canceled nationwide demonstrations Friday, except for one in Cairo's Tahrir Square against the controversial film about the Prophet Mohammed, the group said in a Twitter message. Tragic losses. But, I thought marines were already stationed in embassy and consul? The film has been out since June. Why is this "spontaneous" uprising just now happening? If Obama and Biden hadn't gone through the whole Dem Convention spiking the football about how "Osama is dead, and GM is alive" this would not be happening! Way to go, Dems. The seeds sown by our president on his "apology/we're weak " tours and the interference we joined to overthrow the Egyptian and Libyan governments have reaped this harvest. Also the "we got Obama" re-election theme contributed to the chaos. I do not even know the way I ended up here, but I believed this publish used to be great. I don't recognise who you might be however certainly you're going to a famous blogger in case you are not already. Cheers! umm, a lot of them are that's why they're out there! All you people who are wchating the bank-owned tv media and newspapers are so brainwashed you can't see what is happening under your noses. Your pensions have been squandered by privately-owned corporations and banks, you just don't know it yet. We have been clamoring for a few years now, this is not new to us, because WE are the ones who are suffering for it RIGHT NOW. But we are prepared for the cold, the hunger, the poverty, because we were pushed into it outright, or our friends or relatives have and you better wake up, because when it happens to you, you may not have a clue of what to do. And, if you think your lawyer will handle it, well, I wouldn't be so sure.